When someone has a different opinion than you, you . . . When planning an event, you focus on . . .
What's most important when creating an invitation to a party? When writing an email, what is the best way to get your message across? You focus on the details and processes of the organization. You spend a good portion of your time with data and metrics trying to make sense of how everything is connected and how to create the best efficiencies. 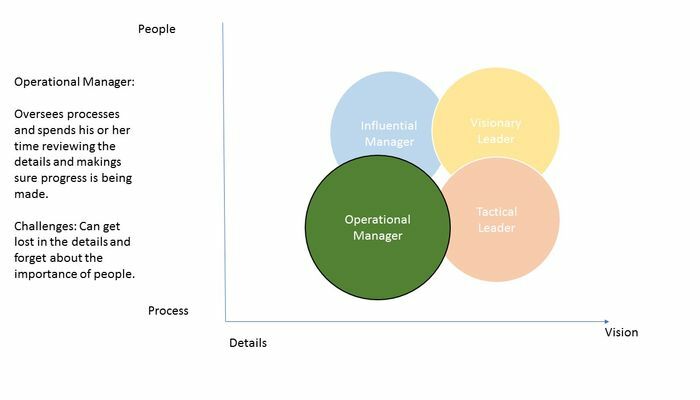 Pros:As a leader with an Operations Management Style, you will know the details of the business well and be able to connect those details to the processes used within the organization. When changes are made, you will be the first to understand the impact on the business. Cons: As a leader with an Operations Management Style, you will at times forget that the processes are used by people who may not easily fit into the described process. Because you spend most of their time in the details, you will lose sight of the larger picture and may advocate for a new process because it makes more efficient sense without understanding its impact on the whole of the organization. 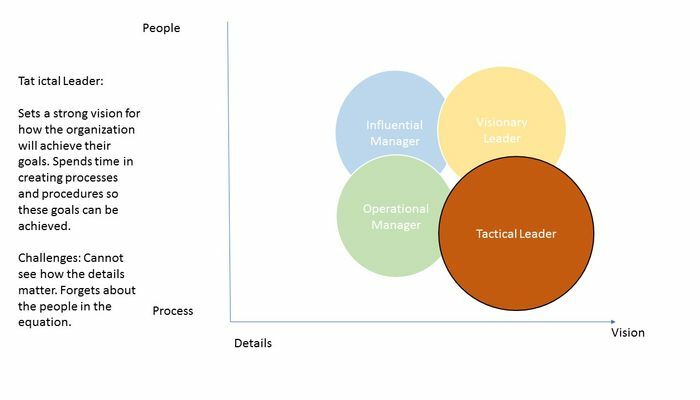 The focus of the Tactical Leader is on how the processes can impact the long-term growth of the organization. You create efficient processes to reach the goals and objectives of the organization. 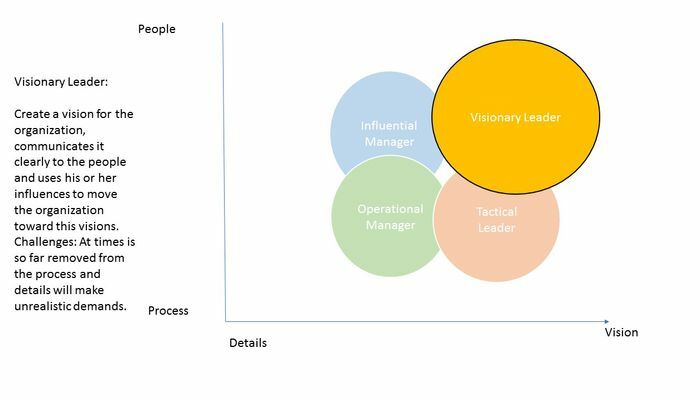 Pros: As a Leader with a Tactical Leader style, you will be able to connect the processes to the mission or vision of the organization. When necessary you can change the processes and procedures to move the organization in the right direction. Cons: As a Leader with a Tactical Leader style, you will focus on the process and the vision of an organization at the expense of the employees and the rest of the stakeholders. May dismiss details as unimportant if they do not align with you vision for the organizaiton. The Influential Manager's focus in on the people of the organization and how the metrics and data tells their story. Pros: As a Leader with an Influential Manager Style, you will work well with individuals across the organization, making sure they are engaged and willing to move the organization to the next level. You provide a valuable resource to the leadership team to gauge the temperature of the employees. 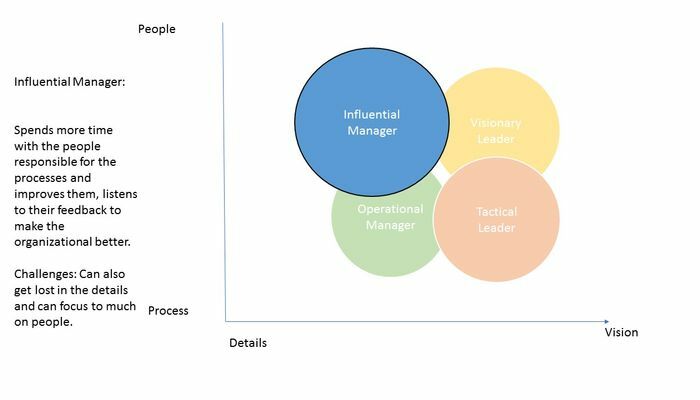 Cons: As a Leader with an Influential Manager Style, you will champion people over process, losing sight of the long-term objectives of the organization. Additionally, you may focus so much on the details that you lose perspective of the long term organizational plans. The Visionary Leader's focus is on the future of the organization and creating influential partnerships to bring the organization to the next level. Pros: As a Leader with a Visionary Leader Style, you will see past the horizon and have a distinct vision of what the company can be come. You will work hard to influence people to achieve the vision you see for the company. Cons: As a Leader with a Visionary Leader Style, you may make decisions without truly understanding the impact on the organization. You can get frustrated with the "management" of the organization getting in the way of success.